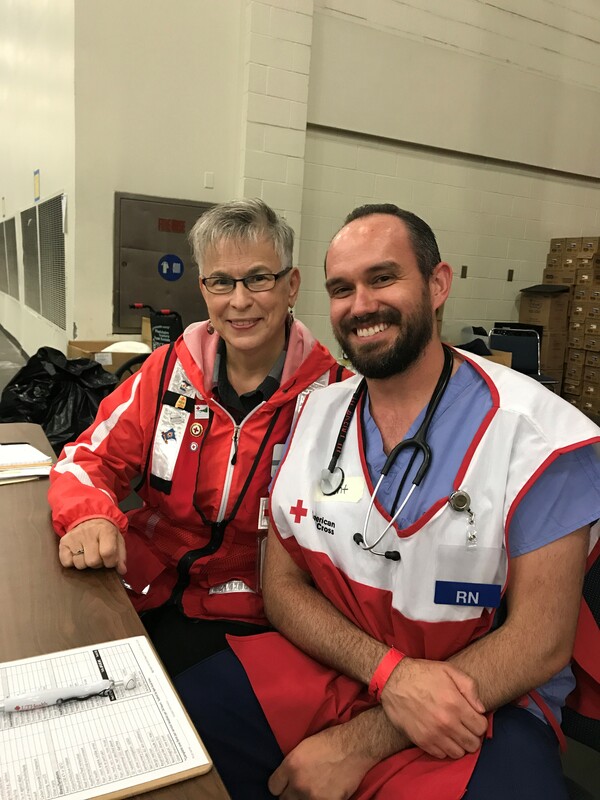 National University alumnus Brent Reel (BSN, 2016) volunteered as a disaster relief nurse during 2017’s Hurricane Harvey. When National University alumnus Brent Reel saw the magnitude of Hurricane Harvey—the wettest tropical cyclone in U.S. history, dumping more than 40 inches of rain on eastern Texas—he knew he had to help. Reel (BSN, 2016), a senior clinical nurse consultant for Cardinal Health, used his own vacation time and frequent flyer miles to get to Houston where he volunteered four days as a disaster relief nurse. Scroll social media sites to find opportunities to help: Reel said that he found out about the opportunity to assist while browsing through a social network for healthcare providers on LinkedIn in the immediate aftermath. That’s how he came across a post from Houston’s George R. Brown Convention Center, pleading for volunteer nurses. Obtaining out-of-state temporary licensure: Reel wanted to get to Houston right away, but he had to wait for a temporary Texas licensure, which meant he arrived five days after the storm first hit. FEMA and the Red Cross had really stepped up to address the most pressing needs of Harvey’s victims and the Convention Center crowd had gone down to 3,000 people, but he still found many needs to address. Expect to work long hours: The four days that Reel spent in Houston passed quickly. Eight-hour shifts became 12-hour-shifts, and toward the end his stay he figured he averaged about 16 hours per day on the floor. Tap into your educational background for answers: Reel studied to be a nurse at National University’s School of Health and Human Services, and that included taking courses in public health and community nursing. He said the courses proved to helpful as he put into practice community-focused approaches to healthcare. Be ready to lend an ear: Some patients who just needed some aspirin ended up talking to Reel and his colleagues for 30 minutes or more – just because they needed someone to talk to. Many of the patients he helped were homeless, low income, elderly, or without friends or family to rely upon.